If you don’t know the story, here’s a recap: David was a shepherd boy in Israel who offered to fight the giant Goliath when everyone else was afraid. He fired a stone at Goliath with his slingshot and hit him in the head. While the giant was distracted, David killed him with his sword. It’s the classic story of the underdog and it resonates with many the world over – whether in sport, politics, business or just life in general. There are loads of examples of small businesses taking on commercial giants and winning – like Apple, a little operation run out of a garage that ultimately took on Microsoft and IBM, and won. So what is it about the little guy? What advantage could he possibly have? 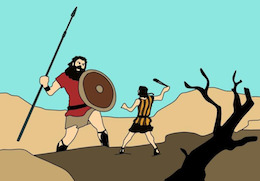 How did David beat Goliath and what lessons can we apply to small business? David had the confidence to step up and face the giant even when trained soldiers were too afraid. If David didn’t win, he was going to die trying. That’s not to say you should always go out guns blazing but you definitely need the inner belief and drive to succeed. Standing tall, being confident and giving it a go against the odds is half the battle. David may not have been as well armed or as strong as Goliath but he knew his way around a slingshot. Small businesses succeed when they keep it simple. You can’t be everything or provide everything to everyone. Big commercial companies will always have more resources, so focus on what you do and do it well. As David proved, small can be more nimble, more agile and more flexible. In business, this means that small businesses are often in a better position to adapt quickly to market changes, without cumbersome processes and other obstructions (including people) to overcome. Everyone thought the only way to defeat the giant would be to match his strength, size and skill, but David took an entirely different approach, using his unique strengths against the giant. Approach your big business competitors the same way – don’t match them, come at them from a different, unexpected angle. The element of surprise will leave them on the back foot. David identified Goliath’s weak spot and attacked it relentlessly. If you can find the chink in your competition’s amour, then you can figure out how to attack it. Large companies are usually well prepared and resourced to respond to a direct attack but, by going under the radar and exposing their weaknesses, you could just find another way to bring them down. One well-delivered stone was all it took for David to bring the giant to his knees. Rather than investing loads of money and resources into lots of different things, try to hone your activities. For example, marketing – rather than firing stones out every which way, narrow your target and hit it with one surefire shot. You’ll have more chance of a direct hit and won’t waste as many stones in the process. Small businesses are the Davids of the corporate world, going up against big businesses with more strength, size, money and resources. It hardly seems like a fair fight but with a bit of ingenuity and by harnessing their own unique strengths, small businesses have the potential to bring the giant to his knees – and how satisfying would that be!